At last year's State of the City event, then Mayor Gary Davis made what he and the City of Elk Grove billed as a major economic development announcement. That March 25, 2016 announcement was that through the efforts of Davis and the City's economic development department a major Silicon Valley high tech company was expanding their operations to Elk Grove and it's fledgling employment oriented Southeast Policy Area (SEPA) development. That company was Fremont, Calif.-based NRC Manufacturing. Davis called it "a game changer" and the City's press release said "the first phase of the project, slated for completion by the end of 2017, is set to include 50,000 SF and approximately 620 new full-time employees. " According to the City, the SEPA-based operation would eventually employ 2,500 workers at a 250,000 sq. ft. facility. While Davis' announcement generated substantial attention, since that time little has happened in the SEPA and NRC's has not moved any of its operations to Elk Grove. 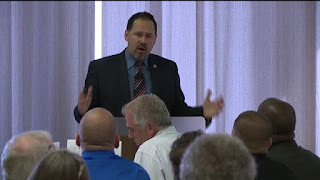 In his June 2016 address to the Elk Grove City Council, economic development director Darrell Doan made little mention of NRC other than in the context of workforce development. Doan said that a large number of high-skill City residents employed by the State of California, as an example, would not be inclined to work for NRC once it opened for business. In a September 2016 interview, NRC Chief Executive Officer Ratha Chea told EGN that they were looking at existing sites and that they would not immediately locate in the SEPA. Ratha also said at the time that they were bidding to purchase a 46,000 sq. ft facility, and that if that sale was consummated, operations could start by July 2017 employing up to 70 people. Reached by phone Ratha today said they lost the bid for the 46,000 sq. ft. facility but with the help of the economic development department was still looking for space in Elk Grove. "We lost the bid," he said. "But we'll keep looking." Doan confirmed the City has been "working diligently" with NRC in its efforts to locate a suitable facility in Elk Grove. "Unfortunately, NRC has been unable to identify a location that meets their operational and financial needs," Doan said. "Elk Grove has a very low commercial vacancy rate and extremely limited existing manufacturing facilities of the size required." Also commenting on the possibility of a built-to-suit space, Doan said it was probably not a viable option for NRC. "I do not see a clear return on investment for the City and taxpayers for a large incentive package that might otherwise make this project viable," Doan added. "We will, of course, continue to work with NRC and other manufacturing employers as we move forward." Ratha affirmed that NRC is still planning on an Elk Grove expansion, and their search continues, but added "we don't know when and where" they would be locating. When asked when the operation might start, Ratha said that not been determined. "Too early to tell that," he said. "I don't have the best idea." And who is to blame here for the lack of commercial space in Elk Grove? How many rezones have their been from commercial to residential approved by the Elk Grove City Council during the last 17 years? If the city of Elk Grove is lacking commercial parks, and are now scratching their heads wondering why, council members and city staff only have to look in the mirror. I seem to recall NRC was courting Apple for a big contract and a Temp Agency also announced they were setting up shop in Elk Grove to handle the NRC hiring. NRC currently has about 10 circuit board assemblers working for minimum wage in Fremont. I can see where it doesn't make financial sense to relocate to Elk Grove when you're just small potatoes! We need to get Trump involved!